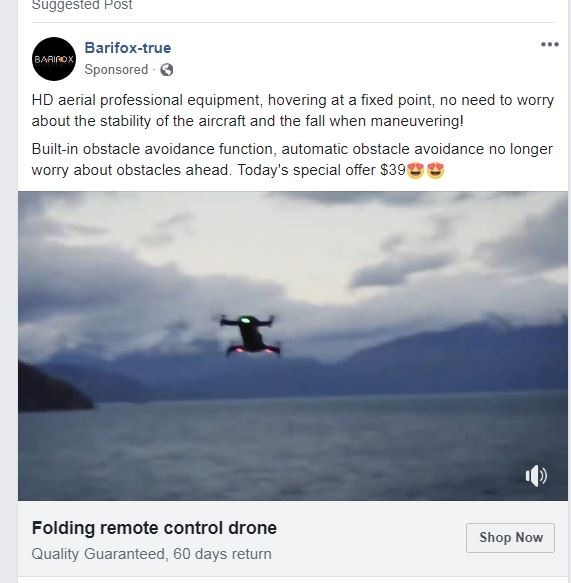 I have been noticing some advertising SCAMS on Facebook recently, buying drones for ridiculous prices with fake information and details about the drone they are trying to sell. This really upsets me when people try to SCAM other people so I decided to write this Blog hoping it will get out there and stop these criminals. See below SCAMMER to watch out you. Alert to DJI: Rampant FB scams. 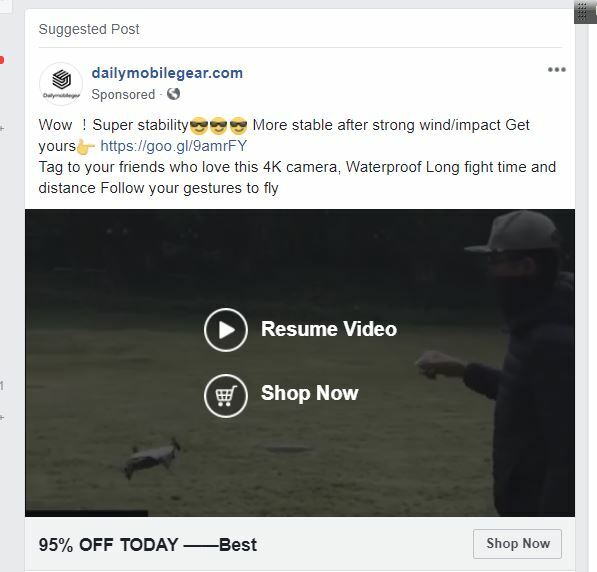 Just thought DJI should be aware, that as of late on Facebook there have been a litany of scam posts by companies advertising a drone for sale using pictures and videos of DJI Mavic drones but either (1) not shipping the user anything or (2) shipping them a drone that isn’t at all what was pictured. They use photos / video of Mavic drones while advertising ridiculously low prices for said drone. For instance, the other day I saw a company advertising a Mavic Pro for 54 dollars. Furthermore, while using the videos they never actually use the words Mavic or DJI or any specific names, as you can see from the attached photo. Thought DJI should be aware so maybe they could contact Facebook to put a damper on these scams. People deeply familiar with the state of drones may not fall for this, but those who aren’t and are curious and maybe looking to get a drone may fall for this as they aren’t familiar with the state of the technology or what realistic price points are. I have also had this happen to me. I ordered a Drone that was advertised as high quality and paid extra for a 4K HD camera and extra battery as well as express shipping. What I received was a toy drone nothing close to what I bought. I have notified the sender, the shipping agent and PayPay and have gotten the run around. I am surprised that Facebook and PayPal have not shut these scammers down to protect the people, like myself, who have fallen victim to these criminal scammers. FOLKS: Remember as I have been reminded “If it sounds too good to be true, it is too good to be true”. Don’t fall for these scam sites. My friendly advice: Don’t fall for this scam, warn your friends and report this lowlife scumbag’s Facebook ads! Update 26.08.2017 – Uavhotclub.com is down. However, they will probably buy another domain to continue their scam. I’ll keep this post up to date if necessary. This list is open. It looks like this is an ongoing Chinese scam that probably made a few hundred victims so far. These websites share the same IP address, 104.250.129.27, which means they are all hosted on the same server, at the same provider (Gorilla Servers – gorillaservers.com) that, if you ask me, also doesn’t look like a trustful web hosting provider. Gorilla Servers claims to be from Los Angeles, California. These are just a few SCAMMERS that will try anything to take your money, please be careful when buying a drone and if you are looking for a great site with excellent reviews and is legal well look no further I will make sure that you are looked after as i’m dead against SCAMMERS, my web site will help you to choose the best drone that will suited for your needs “i will look after you”. Their is a saying that we all know “if it looks to good to be true then it is”, so don’t even waste your time and money following SCAMMERS when you have legal legit web sites like mine, make a good choice and forget about the dream of getting the best deal in the world as it will lead to disappointment. I have already done the home work for you to review all the drones on my web site so you can pick the best the one that suites you, I have also got the best price for you also (no lies only the truth). I have all different brands, I have a drone that will meet your budget needs with out getting you SCAMMED in the mean time, please “check out my site below” you will see that it is legit as i have your best interests at heart. Please drop me a comment in the comment box, let me know if you like my site & if i was helpful to you.